Just saw this for pre-order at HobbyLink Japan and Amiami; Ozma Lee Macross Frontier Skull Squadron Motorcycle Helmet (size Large/Large & Medium/Medium) made by Yamato Toys. Scheduled for release by September, the selling price for either one is 15,130 yen each at HLJ, while 14,540 yen at Amiami. Of course you have to take in to consideration the shipping price of this also because of its weight and its size. Fans of Macross Frontier will be familiar with the bovine like skull head of Skull Squadron Leader, Ozma Lee. 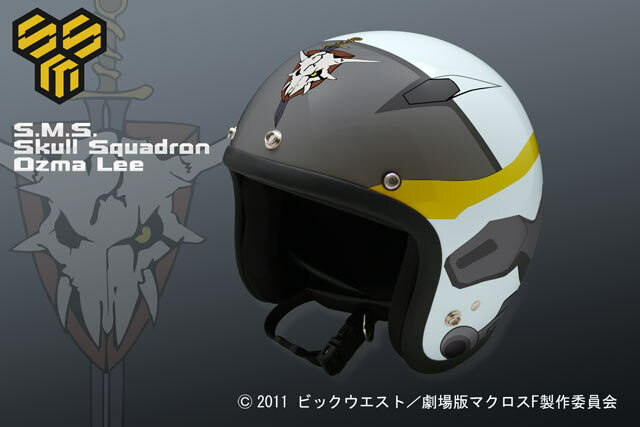 Yamato Toys is no stranger to Macross themed motorcycle helmets having previously released SDF Macross Anime themed motorcycle helmets that were done in the colors of Roy Fokker and Hikaru Ichijo, the original Skull Squadron Leaders.